Over the weekend I held a Syrah wine tasting for a small group of folks. I selected a few bottles from my collection to do a little compare/contrast the different styles out there. 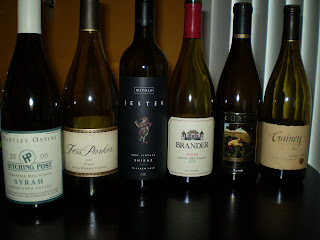 We were going to have 8 different wines to compare but due to a few drop outs (creating larger-sized "tastes") we made it through the six bottles in the picture. Hitching Post Purisima Mountain 2005 - A great wine! Probably the more subtle at first and slowly unfolding in the mouth. Great black fruits, "dusty" like a good Cote Rotie, hints of violet and a touch of what I consider tapenade on the tongue. Excellent tannin/acid balance with a nice long finish. Fess Parker "Santa Barbara County" 2005 - Fess' entry-level Syrah but still quite nice. Ran a bit "hot" after the Hitching Post but nice blackberry, black cherry and peppery notes. Mitolo "Jester" 2006 - Probably the crowd pleaser (and definitely the wallet pleaser), a great easy drinking Syrah that hits all of the traditional descriptions of black pepper, black fruits, black currant and some notes of spice. Easy tannins and nice acidity made it the best stand alone (that is, without food). The one wine where most of the people said food actually diminished the taste. Brander "Santa Ynez Valley" 2007 - a little young but a nice dry Syrah. Bit of a flash in the pan though, lots of raspberry and pepper up front but I didn't get much finish. Tannins could relax a little with time. Curtis "Ambassador's Vineyard" 2005 - Black currents, pepper, hints of oak (vanilla?). Most people thought it could use a little more time as well but showed promise. Gainey "Santa Ynez Valley" 2006 - Nicely done. Blackberry and raspberry, hints of earth and a peppery spice, jammy on the tongue with ripe tannins and tasted oak notes creating a nice medium length finish. I think that if you just want to pop open a bottle of Syrah for consumption you can't go wrong with the Mitolo. If you want something "serious" and want to spend a little more ($33) definitely pick up the Hitching Post (but hurry, they are a boutique producer and make only a few hundred cases). Sounds like a wonderful gathering! It was wonderful, people stayed until quite late just enjoying themselves (which is how things should be).